4 Israeli Defense Forces (IDF) soldiers were killed and 15 wounded after an industrial semi truck driven by a terrorist, rammed into a group of people adjacent to the Armon Hanatziv promenade in Jerusalem on Sunday afternoon. The terrorist who carried out the deadly truck ramming attack in Jerusalem on Sunday afternoon was apparently a supporter of Islamic State, Prime Minister Benjamin Netanyahu said. Netanyahu made his comments at the scene of the attack, where he received a briefing along with Defense Minister Avigdor Liberman. Soon after visiting the site, he was scheduled to convene a meeting of the security cabinet. Among the fatalities were three female soldiers and one male in their 20s. The terrorist was shot dead by security personnel at the scene. The truck’s windshield was riddled with bullet holes, as dozens of first-responders and police secured the scene and completely closed off traffic on the main thoroughfare next to the popular promenade. 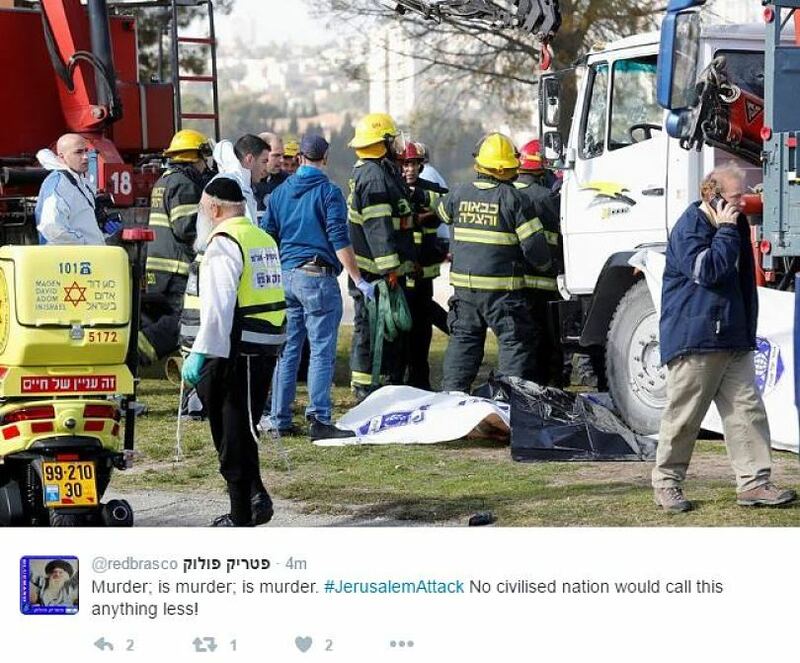 According to Deputy Commander of ZAKA in Jerusalem, Yossi Fraenkel, 10 of the wounded are in light condition, four are in either serious or moderate condition, and one is in critical condition. All victims were evacuated to different area hospitals. "A group had gotten off the bus and were getting organized with their bags when the terrorist took the opportunity, ramming his truck into the group," Israel Police spokesman Micky Rosenfeld said. Speaking to the press minutes after the attack, Police Commissioner, Insp.- Gen. Roni Alsheich, identified the attacker as a resident of east Jerusalem, with an Israeli driver’s license, driving a large truck with an Israeli license plate. Magen David Adom paramedic Landy Sharon who arrived at the scene said that he saw a truck that hit a group of young people that got off a bus near the Armon Hanatziv observation post. Palestinian militant group Hamas praised the attacker. A spokesman called the attack a "heroic" act and encouraged other Palestinians to "escalate the resistance". Hamas spokesman Abdul-Latif said the attack proves the wave of Palestinian violence has not ended, despite a recent lull. "It may be quiet, it may linger, but it will never end," he said.